Our E46LTW is a completely new model for 2016 redesigned and reengineered from the ground up! The brand new concept ergonomic platform is completely free-standing on its own integral base; the NEW E46LTW features oversized ground granite and stainless steel construction combined and equipped with a 22’’ HD touch-screen monitor. The touch screen system is innovatively portrait mounted for easy viewing and operation. The screen layout and simple to use icon based software design, which is spilt into two distinct sections, not only displays visible images of the current tool and profile, but additionally allows access to the full functionality and new capabilities of the software and integral tool management system. The precision spindle system is fully interchangeable and can accommodate cartridges for all types of machine tapers covering HSK, ISO, VDI, BT CAPTO, etc. Incorporated within the spindle is our innovative universal mechanical clamping system with electronic tool clamping confirmation. The innovative, Ubuntu 14.04 LTS LINUX based, software system features automatic recognition of the spindle via SP-ID (NFC - Spindle Identification System). 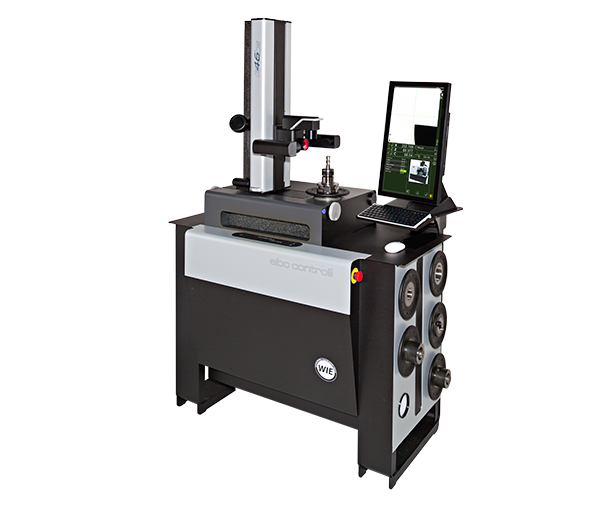 This system allows the Presetter to identify each spindle cartridge as it is loaded and pinpoints or suggests the correct machine origins, whenever the spindle is changed. The Presetter features numerous outputs including several USB ports and a network capability. This allows for the transfer of post processed tool offset data from the tool management system, via a network or even memory stick, to the numerical control of individual machine tools(depending on both the network and CNC controller capability). The E46LTW is equipped with the original camera as on the E46L model (providing the normal tool measurement along with inspection and geometry capabilities from the front) but in addition a secondary high resolution swivel camera (60X magnification with, in addition, 2X and 4X digital zoom capability) to allow and facilitate detailed inspection and geometry functions from both the side and top of the tool profile. This additional capability is particularly useful not only for CNC machinists but also benefits tool manufacturers to precisely measure linear and geometrical features of the tool profile. Measuring range: diameter max. 320 mm (radius 160 mm), height max. 600 mm. Machine structure in steel offering high mechanical durability and long life, floor mounted with 3 fixed support and 1 adjustable support in steel, equipped with keyboard and monitor adjustable support. ISO / BT / HSK / VDI………. etc. Interchangeable rotating spindle-holder (to be specified) max run-out error < 2 µm. Double vault arc prismatic slideways: n°2 X axis slideways, n°1 Z axis slideways. Double re-circulating ball bearing slides, lubricated for life (4) (preloading slides/slideways: P/H class). Universal mechanical tool clamping managed via software (ISO/BT tools only). Tool-holder taper connection control (run-out test, ISO/BT tools only). Opportunity to view the tool from the top (front) or from the side (chest). Thanks to the rotating support by 90° degrees, the camera can be removed from above not to obstruct the measurement operations.